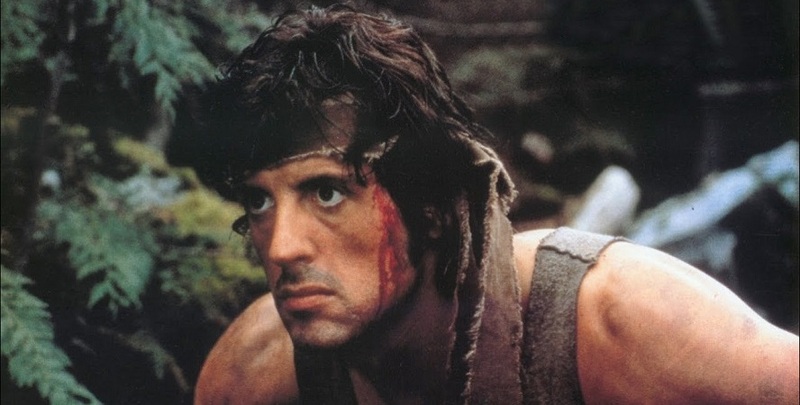 So In the House is back for another season and we’re very excited to see their triumphant return with the first installment in the Rambo action film series: First Blood directed by Ted Kotcheff. I had not previously seen the movie when I came in to the theatre and I honestly had some preconceptions of what I was going to see based off of the pop culture that has sprung up around the film in the decades following. I was expecting an 80s action film with all the machismo and gungho violence inherent to that particular genre (similar to Predator). With that in mind, I holstered hunting knife and headed on down to George St cinemas. Draz and Ryan from the Movie Nerds had a pre-recorded video promo discussing the film’s trivia. The two performed some fine banter and shared some interesting bits of trivia. A couple of my favourites were that the film’s script itself was rewritten over 60 times and that the original cut of the film ran for over three hours which forced Stallone and his agent to push for a shorter (and less damaging) cut of the film which was ultimately released. 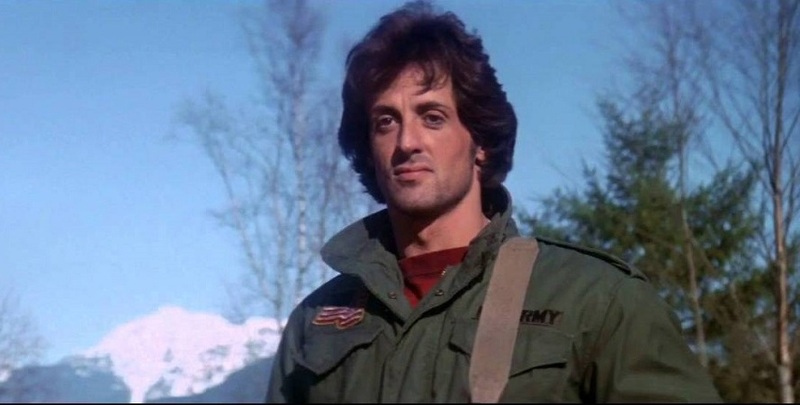 Our story opens with special forces veteran, John Rambo (Sylvester Stallone), meandering across the American West coast when he comes across the sleepy mountain town of Hope. The town’s sheriff, Will Teasle (Brian Dennehy), finds the vagabond veteran a nuisance and harasses John to leave town; John pushes back and gets arrested. During his mistreatment in lock up at the police station, some of the abuse he suffers triggers his memories of torture while serving in Vietnam and leads him to break out of the police station and go on the run. Rambo escapes into the mountains with the authorities soon giving chase but will his guerrilla training and war experience be enough to keep him alive? The script is lean and mean and largely pairs as it can back in favour of giving you more action. The dialogue is sparse with the film setting up the central conflict early on with our two main characters, Rambo and Teasle, butting heads over fairly trivial issues but which grow into something far larger. The film does do quite well with conveying information through other means however. 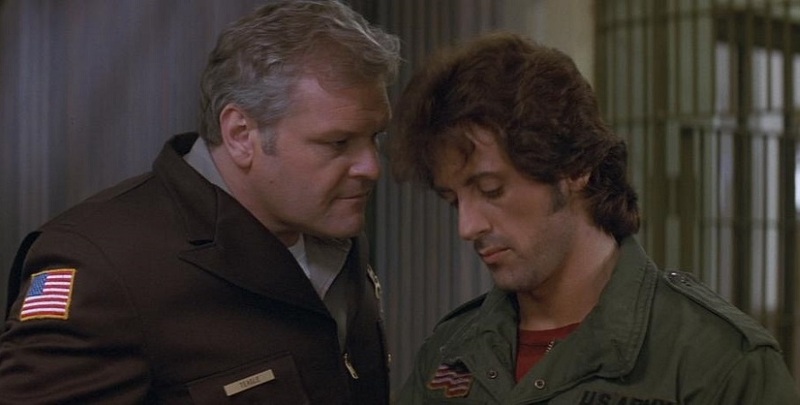 The war experiences of Sheriff Teasle in particular are not discussed explicitly but we see from his medals in his office in the back of a shot suggest that they have an effect on him in the present… and potentially serve as a source for his animosity to Rambo. The one exception to this is Richard Crenna’s Colonel Sam Trautman who laconically discusses Rambo in such glowing terms that the dialogue borders on fan-fictionesque. 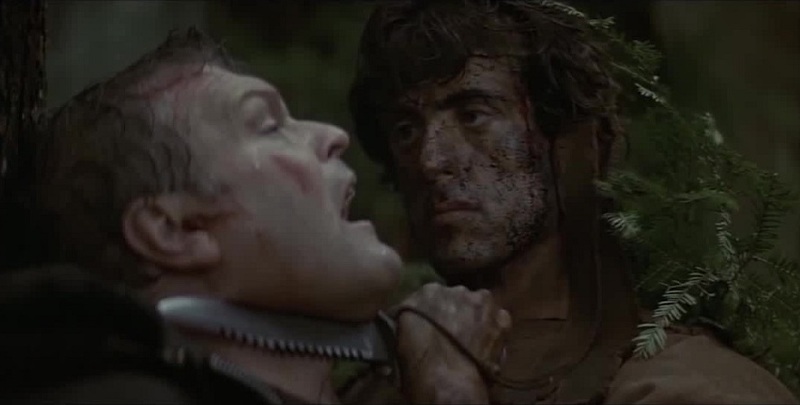 The film’s ultimate climax is where I think the script truly shines as Rambo has his resistance finally brought to an end in a somewhat anticlimactic fashion. His final monologue as he expresses the rage, fear, and loneliness that his character experiences after the war while also dealing with trauma of his experiences while serving reveals itself as a masterful piece of screenwriting. Stallone’s delivery of these final lines are interesting in how he conveys the range of emotions and pain his character is dealing with. His stilted and unclear manner of speaking add a sense of verisimilitude to the character as someone who’s struggling. His performance, alongside Crenna’s as the paternal authority figure who’s grappling with the realisation of failing those in their charge, absolutely sells the scene and the film’s ultimate resolution. The visual direction is similarly paired back with everything except the action sequences. There is some very fine cinematography with regards to depicting the North-Western American mountain wilderness but mostly the camera to showcase the action. 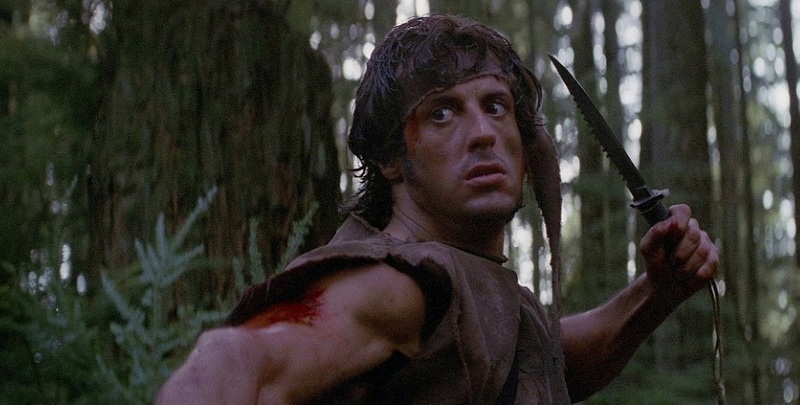 There were a number of sequences in the first act which had unusually long cuts to raise the tension before Rambo finally strikes from the underbrush to attack the police tracking him. The shots are particularly affecting because Rambo has been in the frame but hidden the entire time and so his sudden appearance when he attacks is as much a surprise to the audience as it is to the hapless policeman being attacked. There is not too much that is too grandiose in the film’s visual direction beyond these action sequences but honestly, that’s pretty much exactly what you need to make a film like this enjoyable. The film’s soundtrack is fairly unremarkable but competent in it’s punctuation of the film’s narrative and emotional beats. The film’s score is your fairly common orchestral score but with some noticeable motifs for particular characters. Trautman, in particular, gets a particular trumpet solo whenever he’s on screen which gives a particular militaristic flavour to the soundscape whenever we see him. Ultimately, this score doesn’t leave too much of an impression beyond the film’s runtime but it does what it sets out to do and hits the emotional beats it needs to. Overall, I very much enjoyed my time with this movie as a visceral action experience with a bit of thought under the hood. The story and characters are there to set up the film’s central conflict and don’t do much beyond that save some laconic bits of humour. The film’s visuals are similarly pared back but for the action sequences which it goes to great lengths to depict on the screen. The film’s score performs its job in punctuating the film’s story but doesn’t leave you with any earworms. The film knows what its strengths are and largely keeps to them by paring everything besides the action back. It was an excellent action film to watch on the big screen and I would absolutely recommend this film to any action movie fans and any of you who particularly enjoy Always Sunny in Philadelphia. Kudos to the good folks at In the House with opening with such a banger! 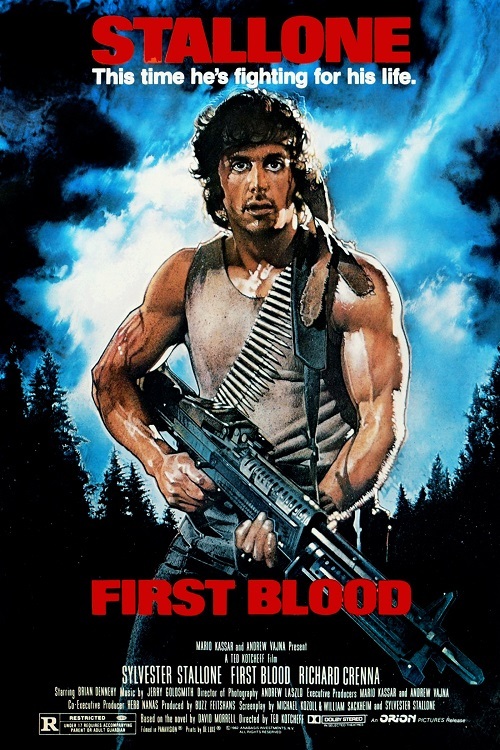 First Blood is an excellent action movie which knows how to play to its strengths and give action movie audiences more of what they want.